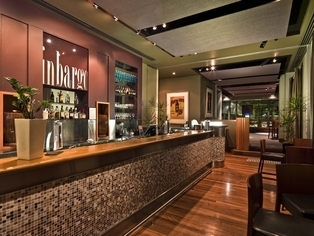 Winner - Superior Hotel of the Year - 2009 AHA (NSW) Awards for Excellence. From the moment you arrive, you'll experience the Amora difference. 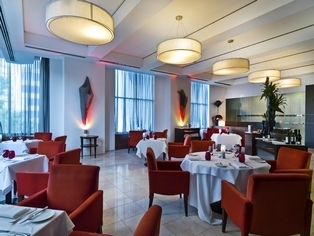 In the heart of this dynamic city, this 5 star award winning hotel combines space, style and warmth to provide the ultimate ambience for business or pleasure. 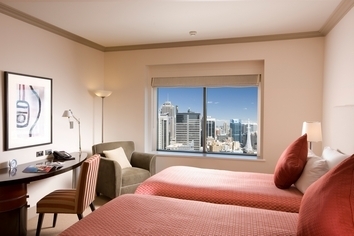 A good night's sleep is the key to a great stay and at Amora Hotel Jamison Sydney our beds are renowned for their comfort. 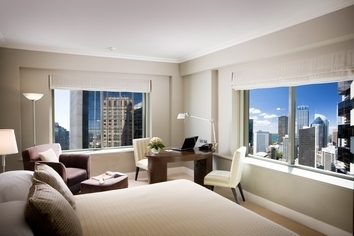 With 415 stylish guest rooms ranging from Deluxe King Rooms to Jamison Club Suites, overlooking the city below, there's plenty to choose from. The warm earthy tones are accentuated by luxurious furnishings, and enhanced by extensive in-room amenities, marble bathrooms and the latest in-room entertainment options ranging from Internet access and computer game consoles. 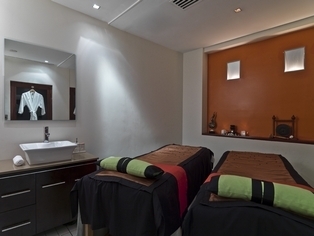 Take yourself away from the everyday, and pamper yourself with a whole floor dedicated to the art of relaxation. At Amora we offer complimentary use of the hotel's indoor swimming pool, steam room, sauna and fitness centre. 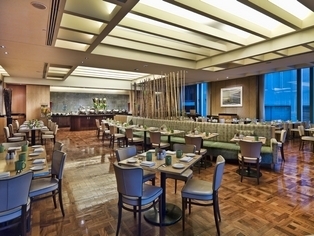 Our two restaurants and two bars can satisfy any appetite with extensive selections, fresh local produce, cityscape views and attentive service. Book a table in Charr the stylish fine dining restaurant where you can experience a mouth-watering contemporary meal or wander into The Gallery restaurant and bar which is open throughout the day, and delivers a breakfast experience which elevates this traditionally humble meal to gastronomic proportions. 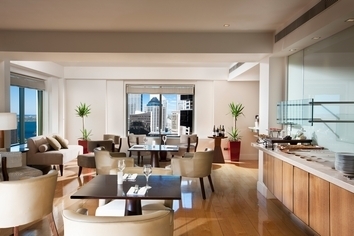 Wine, dine, relax, meet, explore or play the choice is yours at Amora Hotel Jamison, Sydney. Standard room with 1 King bed. Approx 32 Square meters. Located on floors 4 to 29. Views overlook the city skyline and/or Jamison Street. Exceptionally designed and furnished guest room with 1 King size bed. Rates are for 1 or 2 people, a roll-away bed may be accommodated at $50. Maximum 3 people per room. 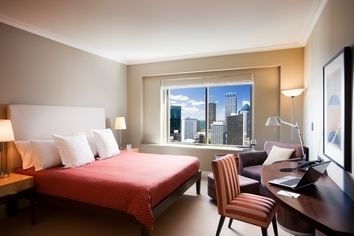 Studio style room with 2 king-single size beds, located on floors 4 â 29 of the hotel featuring city skyline views. 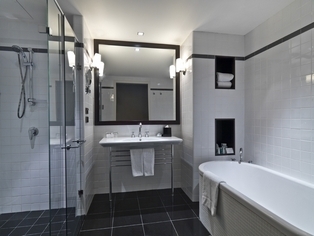 Features large bathroom with separate shower and bathtub work desk with phone data port for dial up and high speed internet access In-room pay movies mini bar complimentary tea and coffee making facilities in room safe hair dryer iron and ironing board. Rooms are approximately 32 sq m in size. All rooms offer Highspeed Broadband access and dial up Internet access at a fee, Voice mail, direct dial telephone & business TV channels. Check in at 2pm. 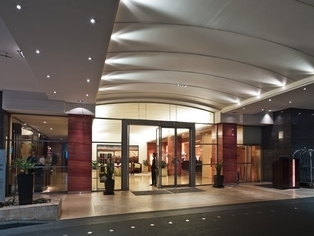 Early check in is subject to room availability at the time of arrival. At check in, a deposit equal to $200 is required to guarantee incidentals. This may be paid by cash or alternatively a pre-authorisation on a credit card may be taken. 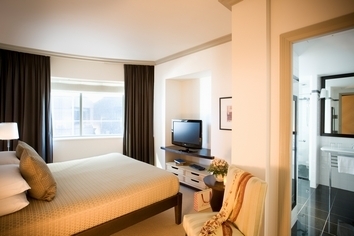 All room rates displayed are based on single or double occupancy. If additional bedding is required for third person, additional charge from $60 per night applies. All room types can accommodate a maximum of three people only regardless of age. A child 12 years and under sharing existing bedding may stay free of charge. Off-street self-parking is available at a flat rate of $40 overnight with multiple entries and exits. Valet parking service is available at $50 per 24 hours. Parking space is subject to availability and cannot be pre-booked. Only 25 minutes' drive from Sydney's International and Domestic airports, or 15 minutes by direct AirportLink to Wynyard Station. Jamison Street is a one-way street accessible from George Street. Travelling north on George Street, Jamison is the first left hand turn after Margaret Street. Amora is perfectly positioned halfway between Circular Quay and Darling Harbour in the heart of Sydneys business district. We are a short stroll from all the major attractions, department stores, boutiques, pubs and restaurants. Enjoy the city's vibrant nightlife and take in a world class show, sporting event or harbour cruise. 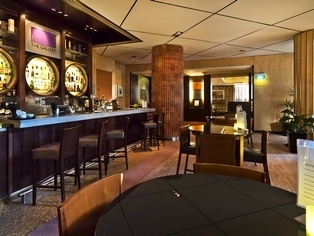 A midweek or weekend break at Amora Hotel Jamison can be as relaxed or energetic as you choose. Everything you might possibly need has been thought of and our experienced, guest focussed staff are on hand to help with any arrangements or tour bookings.